Place the water and dried bonito tuna in a vacuum pack for cooking. Seal and steam in the oven at 80 °C for about 1 hour. Open the bag, filter the content and leave to cool. Pour the tapioca in the bonito infusion and leave to hydrate for 2 hours. Cook in the Bain Marie, drain to eliminate the excess starch, spread on the Silpat and let it dry in the oven at 80 °C for about 2 hours. 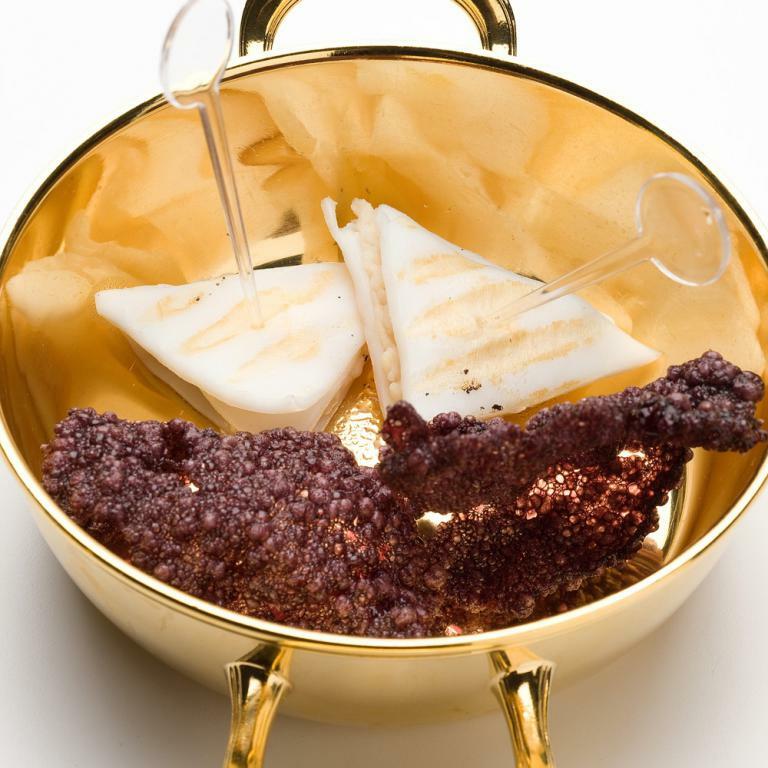 Heat the extra virgin olive oil to 200°C and briefly fry the tapioca, broken into pieces, until it puffs. This recipe can be varied using an infusion of curry or black maize. In the first case, put 30 g of curry in infusion in 500 ml of water; in the second, put 100 g of black maize in the same quantity of water. Thoroughly clean the squid, also removing the skin, cut it in half and place it in a vacuum pack for cooking. Cook it at 63° C for 3 hours, cool it in water and ice and cut it into sandwich-shaped triangles. Place the scraps of cooked squid in a blender with a little soy sauce and blend into a smooth paste. Cut the mozzarella into cubes. Now make the sandwiches: spread the squid paste onto the triangle of squid, place the cube of mozzarella in the middle and repeat the operation to make 3 layers. Heat a sandwich maker to 200° C, place the sandwich inside and cook it for about 2 minutes. Serve it in a bowl with tapioca chips and a tuft of salad leaves.